American travel agents get ready to cycle along the Great Western Greenway. They are pictured with Virginia Goff, Tourism Ireland (second left), and Paul Harmon and Rachel Nolan, both Electric Escapes (back, centre). The promotion of Mayo as tourism destination was given another bump recently with Tourism Ireland arranged visits to the county for a major US tour operator and the Indian edition of the Lonely Plant Magazine which as 100,000 readers. 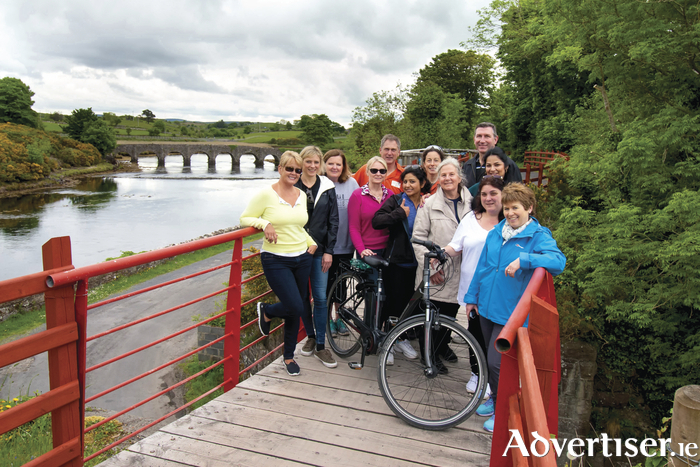 Representatives of Pleasant Holidays – one of the largest tour operators in the United States – together with five of its top-selling travel agents, have visited Mayo and the Wild Atlantic Way, as guests of Tourism Ireland and Fáilte Ireland. Pleasant Holidays launched Ireland as a new destination in January of this year, so the aim of this visit was to give the travel agents the chance to experience some of Ireland’s superb tourism offering, to ensure that when they return home they will be even more enthusiastic – and better equipped – to advise their clients about holidaying here. Their packed programme included a scenic drive to Westport, passing Croagh Patrick, as well as a cycle along the Great Western Greenway from Mulranny to Newport with Electric Escapes. The group stayed at Knockranny House Hotel.